2006-11-15 Steven Stone,Enjoy the Music. 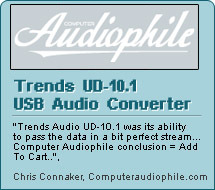 Read More... " Trends UD-10 is simply a must-have for anyone with a computer-based recording or playback system." 2006-11-05 Nick Whetstone, tnt-audio.com. Read More... "Yes, I'm highly impressed! "